Tracey Mays Stehlik serves as the associate athletic director for compliance for Razorback Athletics. In addition, she is a member of the athletic department senior staff and the sport administrator’s group, overseeing swimming and diving. Stehlik began her career as an assistant women’s basketball coach with the Razorbacks, and was a part of the staff that won the only women’s basketball conference championships at Arkansas with back-to-back Southwest Conference titles. As an assistant coach, she recruited some of the greatest players in Arkansas history, including former Kodak All-American Delmonica DeHorney and current women’s basketball assistant Amber Shirey. On 1995, Stehlik left the court and moved into athletic administration. Two years later, she was promoted to associate athletic director for compliance and operation, and she assumed the role of senior associate athletic director for women’s athletics on 2004. Stehlik’s duties included the oversight of compliance, eligibility, academics and event management for the then-separate women’s athletics department. Among her numerous areas of responsibility included serving as the meet director for several Southeastern Conference and NCAA events including the NCAA Indoor Championships from 2003 to 2008, and the 2009 NCAA Gymnastics Regional meet. Stehlik moved into her current role when the Razorback Athletic departments unified in 2008. As the associate athletic director for compliance, Stehlik is responsible for the oversight of all areas of compliance including eligibility, financial aid and the student-athlete opportunity fund. She oversees the day-to-day office operations and its staff and has been a leader in the on-going compliance educational efforts for the department. A 1982 graduate of Alabama-Birmingham with a degree in communications, Stehlik has the distinction of scoring the first point in UAB women’s basketball history as a member of the first Blazer team. 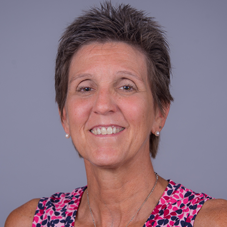 She earned her master’s degree in athletic administration at the University of Kansas where she served as a graduate assistant basketball coach from 1983 to 1985. Stehlik and her husband, Wayne, have two daughters: Mollie, a 2015 Arkansas graduate and Maggie, who currently attends the University of Arkansas. Wayne is the director of athletics for Springdale (Arkansas) public schools.